Interesting Facts: Mismagius is a purple ghost-like Pokémon that has the appearance of wearing a cloak. The three red spheres of Mismagius's necklace have a slightly elliptical shape to them, and its neck appears somewhat long and crooked. It has a round head and a large, elaborate, tufted feature atop it, the extremities of the tufts being a lighter color than most of the body. This feature resembles a witch's hat in shape. 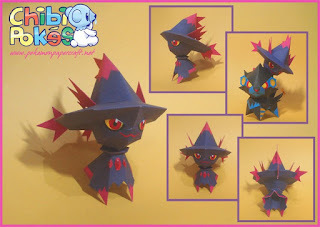 Mismagius has a skinny, red mouth that resembles a "W." There are extensions on the sides of Mismagius's lower body, the foremost ones looking more ragged in appearance than the ones in the back, that give Mismagius the appearance of wearing some kind of cloak. NOTES: Follow the numbers while building. Build the head, and the body from neck to bottom. Attach the head fins as possible. The notes are identical to the Dialga notes below it. Not sure if that's intentional or not. Regardless, cant wait to build this! They are not identical, they are similar, but not exactly the same.